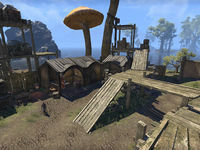 Foundation's Embrace is located to the east of Foundation's Rising in Vivec City. †This person only appears here following the quest Family Reunion. This page was last modified on 8 August 2018, at 19:02.